Spoon polenta onto cookie sheet and spread out in a circle to 1/2 in thick about 10-12 inches in diameter. Sprinkle with salt and pepper. Once onion is tender and bacon is crispy, turn heat off and remove bacon and onion with a slotted spoon, and transfer to a paper towel covered plate. Put 1 bag (10 oz) of spinach in pan and turn heat to low, coating the spinach with leftover oil and cooking juices. Spinach will wilt in about 3 minutes. 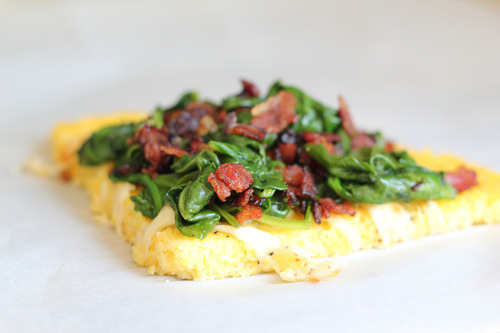 Remove wilted spinach from pan and mix with bacon and onions. Once polenta crust is out of oven, top with the spinach mixture and cut into slices. So good!!!! !